Don’t Drop Your Monkey Cup! Values. According to commonly practiced “rules” of both personal development and strategic planning, individuals, teams and organizations must identify their Core Values and live by them to be authentic and successful in pursuit of a vision. I agree wholeheartedly. Understanding what one values most explains so much that might otherwise be misunderstood, difficult or just down-right confusing. Everyone lives by a creed, basic values, a moral code that is either spoken or unspoken…adhered to or not…acted upon either consistently or inconsistently. Can you articulate your values and live by them as well? Values guide our decisions; values determine our choices; values define our character and the product of our days. Values, whether we are aware of them or not, determine how we act, how we treat others, how we respond to opportunity and adversity, and how much value we add to the world around us. Values may make my behavior easy to predict, but in a good way. My values create a clear image of the person I strive to be. Values inform our expenditures of time, of money, of relational collateral and of commitment to change. I’ve written this before but it always bears repeating: if you aren’t sure where to begin identifying your core values look at your checkbook register and your daily planner; where are you investing your primary resources of money and time? Ask yourself what you really want, and ask your friends and loved ones about what they think you value most. Values. They make us who we are as individuals, as families, as businesses, as churches, as 4-H clubs, or however we come together in community or corporate purpose. What are your values? What do you hold most dearly? I also know that Marie values family, her daughter and husband, and her ministry of Spreading Joy through powerful actions that add measurable value to her community. These things she holds dearly. What you value most is what matters most at The Intersection of Purpose and Now. What things, what ideals, what relationships are you “holding onto dearly”? What is it that you are willing to “toss out”? What do you really want out of life? What do you really want to experience today? What is it that you want others to say and believe about you? Living at The Intersection of Purpose and Now is about living a remarkable life by your own God-given definition, stabilized and purified by focusing on your most valued beliefs and relationships. Living at this Intersection is about personal leadership. It’s about knowing your purpose in life and your purpose in this moment. It’s about thinking On Purpose, feeling On Purpose, acting On Purpose. Living at The Intersection of Purpose and Now is about re-connecting your thoughts and actions with your deepest VALUES and purpose, and engendering the same connection in others. It’s about having the courage to take action now on the things most important to you, about achieving what may seem just beyond your reach. Living at The Intersection of Purpose and Now is about holding on to your Monkey Cup and, if you should ever drop it, mending it with loving care and glue that holds it to its original design. 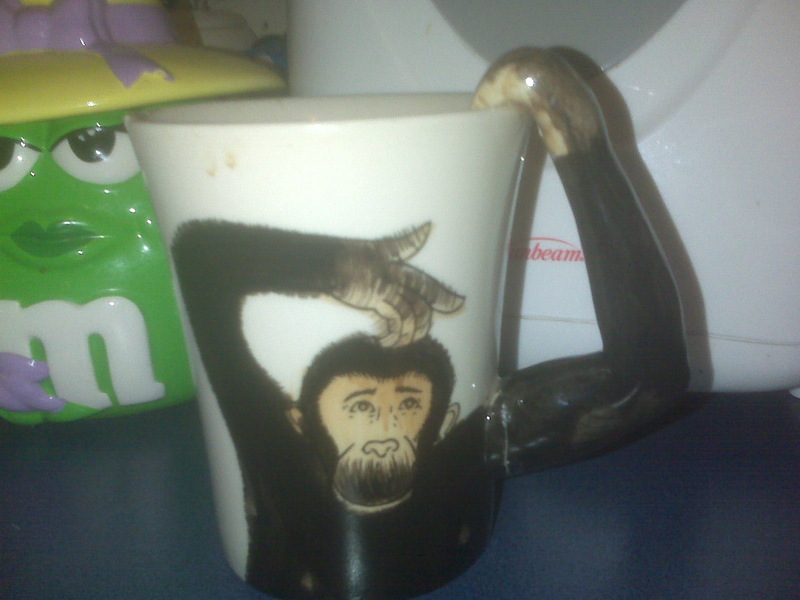 Don’t Drop Your Monkey Cup. Hold onto it dearly. Join me at the Intersection of Purpose & Now. This entry was posted in core values, personal development, strategic planning, values. Bookmark the permalink.